When is the next Ice Age due ? According to Emily Shuckburgh and Prof. Erik Wolf in a letter to the Times , the next Ice Age is not expected for another 50,000 years. Their claim seems to be based on a 2016 paper in Nature by Andrey Ganopolski, R. Winkelmann & H. J. Schellnhuber, Nature 529, 200–203 (14 January 2016). The paper also claims that the Earth narrowly avoided the inception of a new ice age just before the Industrial Revolution, because CO2 levels were 40ppm above some hypothetical threshold of 240ppm. Of course humans were responsible for this (luckily this time) due to deforestation and land use change. The leading hypothesis currently is that Ice Ages initiate when summer insolation reduces sufficiently so that it fails to melt back the previous winter snow. Ice then slowly accumulates leading to an increase in albedo as the northern ice sheets slowly grow. There are two causes for this effect, both of which interplay one with the other. Changes in the obliquity of the earth modulate summer insolation at both poles. Precession of the seasons, due to the precession of the earth’s axis, change the timing of the summer equinox. Combined together they then modulates the distance ‘R’ to the sun during summer months, simply because the earth has an elliptical orbit . The strength of this precession ‘forcing’ is amplified by at high eccentricity. Note how the obliquity cycle reasserts itself if eccentricity is high. 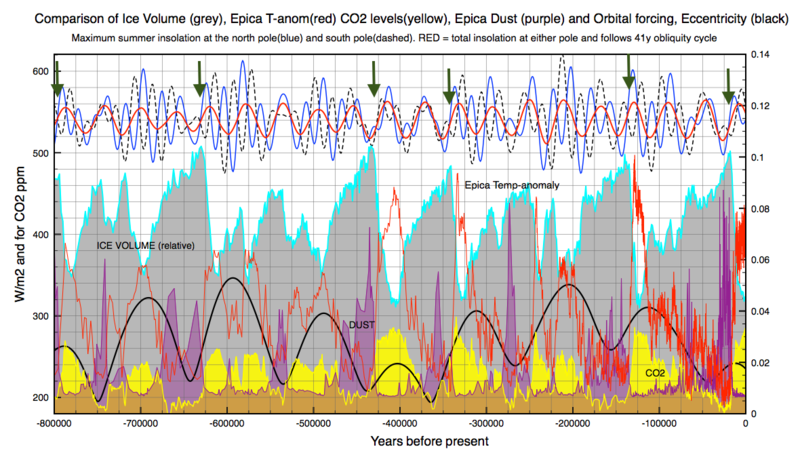 The 2 glacial periods 600,000y ago and 300,000y ago are essentially co-joined 41k cycles. Until 800,000 year ago ice ages followed the 41,000 year obliquity cycle. Low obliquity reduced summer insolation at the poles and glaciers expanded. High obliquity reversed this initiating an interglacial. No-one knows for sure why this change happened, but it is usually assumed that the ice sheets became too large for obliquity alone to melt them back. They then also needed the help of the precession term acting on the expanded northern ice sheets. However, this does not explain why these insolation minima only work once ice sheets have reached some critical size. One attractive explanation to explain this is CO2 starvation . CO2 levels in the atmosphere naturally increase with the onset of an interglacial as a result of the warmer temperatures and an enhanced life cycle. These increases in CO2 act as a small positive feedback on temperatures. Glaciation begin at high values of CO2, which in general then fall with reducing temperatures and reductions in biosphere activity. However during the Eemian CO2 levels remained above 260ppm for some 35,000 years into the last ice age. If CO2 plays any role in Ice Ages, it is just a supporting role as a feedback. So when would the next ice age naturally begin had humans not burned any fossil fuels ? The Anglian interglacial some 400,000 years had similar orbital eccentricity to that during the Holocene. The preceding glaciation was also very severe like the that preceeding the Holocene. The Anglian interglacial lasted about 25,000 years which is roughly twice as long as average. Cooling initiated on a reducing obliquity coinciding with a northern summer minimum. The Holocene interglacial has northern and summer hemispheres inverted but obliquity still follows almost the same pattern. The minimum to which Ganopolski refers to as a close call pre-industrial inception is really nothing of the sort, since obliquity was still too high. I believe cooling would naturally begin another glaciation before 10 thousand years from now as we approach minimum obliquity. At the latest it starts 15,000 years from now. So will anthropogenic global warming delay the onset of the next ice age for 100,000 years as the authors argue ? So after 15,000 years we end up with CO2 levels = 280+ (0.08)*280 = 302 ppm. The remaining anthropogenic CO2 forcing works out at only 0.4 W/m2, whereas the drop in summer insolation over the Arctic between now and the next obliquity minimum is 22W/m2 . That is 50 times larger! 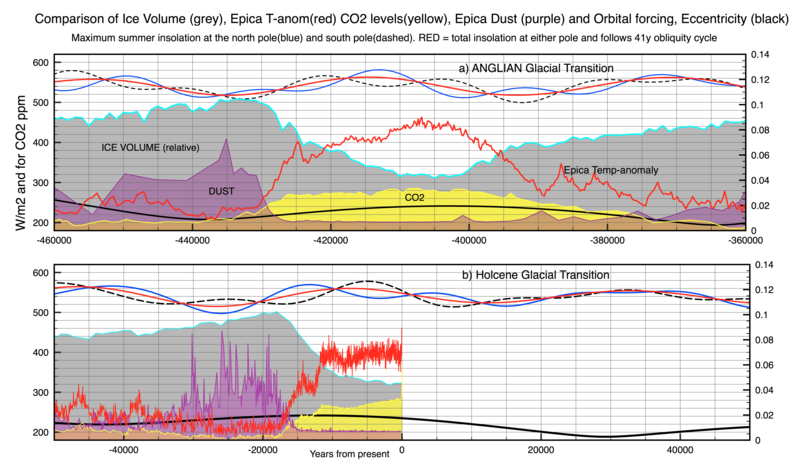 Following both the Eemian and the Anglian consequent glaciations all began with CO2 levels well over 280ppm. There is no reason to suppose that the Holocene will be any different, assuming that CO2 levels peak below 600 ppm this century. Perhaps in 10,000 years time we will have learned to control the earth’s climate to the advantage of all life through managed CO2 emissions. 13 Responses to When is the next Ice Age due ? Earth’s temperature cannot be controlled by using co2 emmisions as co2 has a declining effect. In my view precession is a red herring and should be removed from the graph. Question. What components cause the change in obliquity ? Obliquity is caused by changes of other planets as they orbit around the sun. Basically the orbit of Jupiter is inclined to that of the earth. Obliquity or the change in obliquity ? I had thought that the 41kyr change in obliquity was a function of precession and various wobbles, nutation, chandler which produced a net 41 kyr change in obliquity. Having a little trouble with Archer’s quoted assessments. OK, large portion of CO2 emitted into the atmosphere is dissolved into the oceans, which results in acidification, which brings oceans carbonate buffer system to bear. OK, over long enough time periods exposure of basic mineral rocks on earth surface precipitates carbonates and reduces atmospheric CO2 load. However, everything else in Archer’s quote seems to suggest that CO2 will react with water to form carbonic acid, which will react with CaCO3 somehow resulting in conversion of CO3 to…what, something other than CO3, which on a global scale is at equilibrium with atmospheric CO2 ? That is, at best, one cannot reduce air CO2 levels by dissolving the CO2 in water to form carbonate and then reacting it with a carbonate (-CO3). There is no mechanism for a full reaction sequence resulting in reduction in air CO2 unless there is a net alkaline earth ion available to precipitate the carbonate. That is, unless I am missing something, the CO2 balance on the years between a couple hundred and a couple hundred thousand needs to be reconsidered. There is also the small matter of we do not know what temperature and/or acidity thresholds may lie in wait with respect to bio- and other feedbacks in the ocean system. Seems a bit like playing with fire next to a large fuel tank. Tank might be empty, full or somewhere in between. Might be good idea to figure that out before taking bets on whether or not striking matches is a good idea. Bryce, your wet chemistry is largely sound. But there is more going on than just simple neutralization of carbonic acid (dissolved CO2). What you are missing is the biological component to the carbon cycle. Foraminifera consumes CO2 in sea water precipitating CaCO3 which as deceased micro-sea life, diatoms and husks. The rate at which this occurs is actually one of the common types of paleo-climate temperature proxies. The warmer the water the higher the hypothesized rate of biological activity. Pardon my delayed reply here…I was inexplicably not connected to Clive’s site for a while for some reason. 1. Carbonate (-CO3) cannot be used to react with carbon dioxide (CO2) to form still more carbonate. CO2 can cycle out of -CO3 and then back into CO2 again, round and round, but there is no net “sourcing” or “sinking” from such a process. 2. The intensity of the role of carbonate in the carbon cycle is fundamentally dependent on the supply of cations that will form carbonate salts that are insoluble under relevant environmental conditions. If there is a large geological source of dissolved calcium and magnesium ions, there will be massive removal of CO2 from the atmosphere by precipitation in the oceans as CaCO3/MgCO3. Hence, the massive geological limestone formations known around the globe. As I recall from my geology, those formations developed during periods of unusual amounts of volcanic activity that dumped CO2, but, and perhaps more importantly, also released exceptionally large amounts of relatively soluble mineral forms of calcium and magnesium onto the surface of the earth. Voila…massive amounts of carbon as carbonate in massive limestone formations. Point 1 does not allow Archer’s statements “Chemical neutralization of CO2 by reaction with CaCO3 on the sea floor…” and “Reaction with CaCO3 on land…”. He may have meant “reaction to” instead of “reaction with”, but if he did then we run into Point 2. There is a shortage of calcium and magnesium to even remotely approach accounting for current, let alone forecast future, CO2 emissions, and there is no humanly controllable means to overcome the Ca/Mg shortage without use of additional massive amounts of fossil fuel. I do not know where Archer made his statement, but it seems to me it should not have passed peer review had there been any. It strikes me such conjectures about what might happen 200,000 years from now is moot at this point. What is far more important is what is likely to happen in the next 2 to 200 years, which Archer dismisses by simply stating the oceans will dissolve 70%-80% of CO2 released in several hundred years. The ocean buffer system is complex, but stoichiometry requirements remain. There is no reason to expect increases in geological releases of Ca and Mg. There is good reason to foresee further increases in atmospheric CO2, consequent rises in dissolved CO2/CO3 in the oceans with consequent precipitation of (biotic and abiotic) Ca/Mg carbonates. It is indeed virtually certain that the system will come eventually to some quasi-equilibrium reminiscent of previous periods on earth. However, what is interesting and operationally important is the path the system will follow back to that equilibrium. Cursory summary treatments that are either so poorly worded or ill-conceived as Archer’s do not shed light on any likely path of concern. Your actual assumption appears to be eradication rather than curbing. Continuation of some reasonable level of curbed emissions, say 20% of current levels, would keep CO2 up at around 600ppm. The remaining anthropogenic CO2 forcing works out at only 0.4 W/m2, whereas the drop in summer insolation over the Arctic between now and the next obliquity minimum is 22W/m2 . That is 50 times larger! If we look back at the early-Pleistocene/late-Pliocene, that magnitude of change in insolation was happening, yet paleo records do not indicate the existence of comparable glacial cycles. CO2 levels at the time are estimated to have been a little under 400ppm. So, we have <2W/m2 CO2 forcing versus 22W/m2 summer insolation difference. Still much larger, and yet little apparent effect at that higher CO2 level. It's therefore reasonable to propose that even a relatively small difference in CO2 level above typical maxima for the past million years will significantly modify glacial cycle behaviour and that there is a threshold for effectively shutting down glacial cycle occurrence between 300 and 400ppm. It’s therefore reasonable to propose that even a relatively small difference in CO2 level above typical maxima for the past million years will significantly modify glacial cycle behaviour and that there is a threshold for effectively shutting down glacial cycle occurrence between 300 and 400ppm.The isthmus formed around 2.8 million years ago. Besides 100ppm CO2 there were geological and hydrological differences between the Pliocene and Pleistocene. The North American collided with the South American plate 2.8 million years ago. This major geological event separated the Atlantic and Pacific Oceans and caused <a href="https://link.springer.com/article/10.1007/s00382-016-3298-x"major changes in ENSO the AMO. Also, there is evidence that a strong PMO existed in the Pliocene that pumped warm equatorial waters to the arctic. Here is another very recent paper (full text here) that explores evidence of a transition in Earth’s hydrology 2.6-2.8 million years ago. An essential element of modern ocean circulation and climate is the Atlantic meridional overturning circulation (AMOC), which includes deep-water formation in the subarctic North Atlantic. However, a comparable overturning circulation is absent in the Pacific, the world’s largest ocean, where relatively fresh surface waters inhibit North Pacific deep convection. We present complementary measurement and modeling evidence that the warm, ~400–ppmv (parts per million by volume) CO2 world of the Pliocene supported subarctic North Pacific deep-water formation and a Pacific meridional overturning circulation (PMOC) cell. Why don’t any of these elaborate discussions include an overlay of solar cycles…or at least some mention of the variation in the source of the energy of concern? Hi Clive, I really like your site. Only recently I got interested in this material. I live on a (Saalian) ice-pushed hill ridge in the Netherlands. There is some similarity in insolation each 400,000 years, due to Venus and Jupiter. But some 400,000 years ago the average level of insolation was significantly lower than today. In the past we had much deeper minima to start glaciation. So I am not so sure if we should expect glaciation soon. It is far too warm to melt winter snow at 60NB. What is your opinion?